Marchionne: Wrangler decision will be made "fairly quickly." GENEVA -- Fiat Chrysler Automobiles CEO Sergio Marchionne confirmed that the automaker is mulling a proposal from the city of Toledo, Ohio, to keep Jeep Wrangler production there. But beyond that, he was noncommittal. 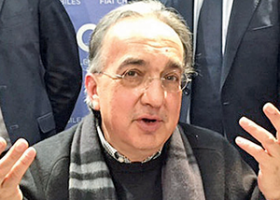 "I think we're working through our numbers now," Marchionne said. "I don't have a view. We will make a decision fairly quickly." Civic leaders in Toledo have offered an incentive package to keep the Wrangler there, even though Marchionne has said the community would not suffer job losses if production of the SUV was moved. He also said that, though the initial public offering of Ferrari stock could be delayed until the third quarter, the spinoff of Ferrari would happen by year's end. Regarding the public sale of 10 percent of Ferrari stock to help finance FCA capital plans, Marchionne said, "There's no urgency to this. The objective is to do the spinoff at the end of the year." Regardless of the spinoff, Marchionne said, the racing heritage of Ferrari will be respected. "The heart of the brand is racing," he said. "This is not an accident. We are not Aston Martin." He added that Ferrari needs to improve its Formula One performance: "We need to correct the situation, and we need to correct it now." During the question-and-answer session, Marchionne said he thinks the prospects for fully autonomous driving are overstated. He added that the stronger role taken by the National Highway Traffic Safety Administration in the U.S. is likely to result in slower adoption of automated-driving features. "I think that interface has to be taken into account by anyone that's making a paradigm shift," Marchionne said. But he said he expects to see highly automated features "with the possibility of becoming autonomous" under the driver's control in cars by 2019.